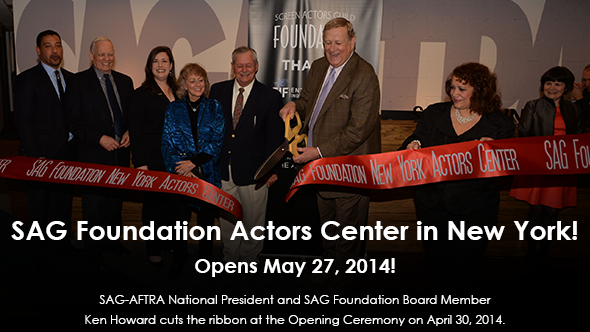 May 1, 2014 (New York, NY) —Over 150 performers and supporters of the SAG Foundation turned out in the rain to celebrate the opening of the SAG Foundation Actors Center. Some of New York’s most beloved stars included Robert DeNiro, Len Cariou (Prisoners), Maria Cellario (Chasing Butterflies), Ryan Eggold (The Blacklist), Rich Lamb (CBS New York), Greta Lee (Girls), Harry Lennix (The Blacklist), Judith Light (Dallas), Margo Martindale (The Americans), Samantha Mathis (Under the Dome), Julianne Michelle (Awakened), Joe Morton (Scandal), Charles Osgood (CBS News Sunday Morning), Vincent Piazza (Boardwalk Empire), Michael Potts (True Detective), Alysia Reiner (Orange is the New Black), Steven Wallem (Nurse Jackie) and Isiah Whitlock (VEEP). After years of providing high quality, no-cost educational programming to New York performers without a dedicated space of its own, the Screen Actors Guild Foundation has finally found a permanent home at 1900 Broadway across the street from Lincoln Center. The highly anticipated SAG Foundation Actors Center, officially opening in late May, will allow the Foundation to accommodate the growing demand for its popular New York programming. Newly appointed New York Film Commissioner Cynthia Lopez attended the celebration and joined SAG-AFTRA National President and SAG Foundation Board Member Ken Howard, SAG-AFTRA National Executive Director and SAG Foundation Board Member David White and SAG-AFTRA New York Board Member and SAG Foundation Board Member Rebecca Damon with the official ribbon-cutting. “Whether union performers live in New York or find themselves in New York for work-related opportunities, the SAG Foundation’s Actors Center will be a free resource to the New York performance community,” said Jill Seltzer, SAG Foundation Executive Director. The SAG Foundation Actors Center includes a classroom/on-camera audition room, a computer lab, office space and the Entertainment Industry Foundation Voiceover Lab of the SAG Foundation. The Actors Center was made possible by the extraordinary support of the Entertainment Industry Foundation, Screen Actors Guild Motion Picture Players Welfare Fund and PEOPLE. The EIF donated $300,000 to build a state-of-the-art voiceover lab and the SAG-MPPWF awarded $250,000 to assist with capital and operating expenses. “We are unbelievably grateful to the Entertainment Industry Foundation, the SAG Motion Picture Players Welfare Fund and PEOPLE for their commitment to expanding the SAG Foundation’s New York programming for performers and for the very generous gifts that will ensure that this critical, career-building programming is here to stay,” said JoBeth Williams, actor and SAG Foundation President. “Over the last three years, the SAG Foundation has been attracting full houses in New York City with our quality performers’ programs, and our efforts to create a real home have paid off,” said Rebecca Damon, actor, SAG Foundation Board Member and SAG-AFTRA National Board Member. Since 2010, the SAG Foundation has tripled its New York programming and events and now offers over 220 free workshops with casting directors, panels with industry professionals, film and television screenings, career Q&As with renowned actors and special events to more than 10,000 New York union performers annually. In addition, the SAG Foundation provides an avenue for performers to give back to their communities through its volunteer children’s literacy program BookPALS (Performing Artists for Literacy in Schools). More than 475 SAG Foundation BookPALS read to over 8,000 students in 130 New York public schools every week. The Screen Actors Guild Foundation provides vital assistance and educational programming to the professionals of SAG-AFTRA while serving the public at large through its signature children’s literacy programs. Founded in 1985, the SAG Foundation is a national non-profit organization, independent from SAG-AFTRA, and relies solely on support from grants, sponsorships, and individual contributions to maintain its programs and create new ones. For more information, visit sagfoundation.org.